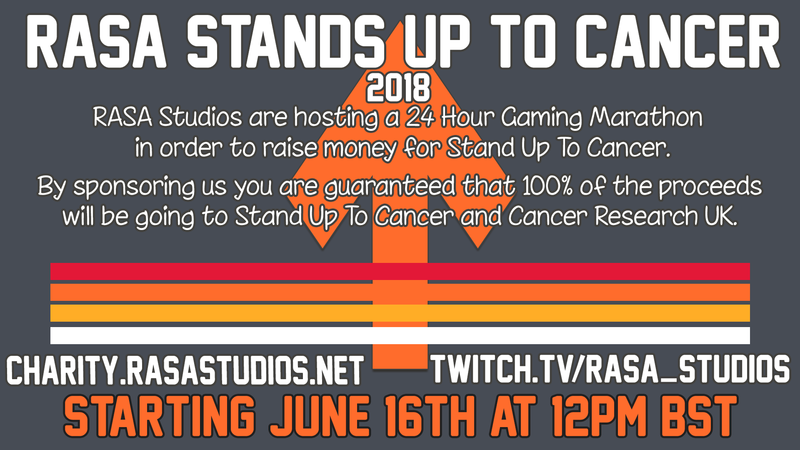 For our second time ever, RASA Studios will be hosting a 24 hour charity livestream next Saturday (16-17 June) in aid of Stand Up To Cancer. The stream will be starting at around 12PM BST on Saturday, and we'll be going for a full 24 hours (at least!) with many members of RASA Studios. You can read more about it at our website, charity.rasastudios.net (slightly different to last time!). On that website, you can find our currently planned schedule for the stream, as well as a link to donate. Last time we rasied an incredible £505 (+Gift Aid), and we'd really appreciate if you could help out again - even if it's just a little bit. Cancer is something that strikes very close to home for some of us in the team, and we'd like to do our bit to help out. We hope that you'll join us next Saturday at 12PM BST on the RASA Studios Twitch Channel!